Our text today has a profound message for the Christian. Our true salvation and security does not come from Washington DC. It is not dependent on who is in the White House and some political office. Next year, November 2016, Americans are going to elect a president that will lead our country for the next four years. All elections are important, but they are in the past and they had a important part in bringing our nation to its present condition. This coming election, too, is important; especially because of the great threat our world is facing and because it is in such unsettling times. There is much at stake. Our nation for many years has been moving further and further away from the biblical principles on which is was founded and which made it the most powerful nation in the world. At stake is the advancement of the Devil’s agenda for the destruction of this country. What is at stake in our nation is the advancement of the agenda of those who have made the murder of innocent unborn children legal and socially acceptable. At stake is the advancement of the Devil’s agenda of bringing homosexual behavior to the point of being fully accepted not only in our society, but in churches as well. At stake is the future of our children. Who are being bombarded by the those of the homosexual community who have taken over our schools, our courts and government. Yes, I did not say they were trying to take them over….they have already won these institutions. America is in fact fast becoming the rebirth of Sodom and Gomorrah. No nation or civilization has lasted that allowed homosexuality (and gay marriage) to become part of its society. God said He would have spared Sodom and Gomorrah if only then righteous people could be found. That shows the influence of Christians on their nation. Lot lost most of his family…and that shows the destructive influence this gross sin has even on the families of the righteous. I encourage you to go to the polls in 2016 and vote the way God directs us in His word to vote. Vote for those who best reflect the morality and principles of God who Created us. But our text today has a profound message for the Christian. Our true salvation and security does not come from Washington DC. It is not dependent on who is in the White House and some political office. Yes, it is important to have those in public office who are moral, decent God-fearing persons and we pray that they will be the one’s who govern us….but sadly those kind of people rarely get elected. The immoral times we live in is reflected in the immoral leaders that have been elected. Our government is full of openly homosexual people. How then does God instruct us? I. What is more important…..a Christian president or you as a child of God living a godly life? Each of us here today is voting everyday of our lives……we are voting for righteousness and for the Lord…..or we are voting for Satan. Our vote either honors God or it honors Satan. A. “If my people, which are called by my name, shall humble themselves, and pray, and seek my face, and turn from their wicked ways; then will I hear from heaven, and will forgive their sin, and will heal their land” (2 Chronicles 7:14). B. What does that verse say will bring the blessings of God? 1. “If my people.” Who are “my” people? 4. What does the name Christian mean? It means those who identify themselves with Jesus the Christ….God incarnate in the flesh, our Savior, our Lord and our God. 5. Certainly this passage is addressing those who call themselves Christians. C. The verse presents three promises of God. D. Dear friends do not we today, in this land, and in this church, and in our families, and in our personal lives….need God to hear us? Do we need God’s forgiveness? Do we not need our land to be healed? E. I want also to point out that when God offers us His blessings it is always because we have a need…..and He is offering to help us, to take our burden, to bless us. Further with the offer of His good blessing there is always qualifications for receiving the blessings. 1. God cannot bless error, nor sin, nor those who ignore Him and will not live by faith. Hebrews 11:6 plainly states it is impossible to please God without faith. 2. What faith? A faith that daily lives for the Lord. A faith that produces faithfulness in our lives. A faith that gets us to church, a faith that longs to express itself in worship and thanksgiving to the Lord for all He has done for us. It is a faith that controls our mouths, that orders our steps. It is a faith that takes the God given responsibility to raise our children to love the Lord. It is a faith that rejects worldliness and worldly pursuits that rob us of giving God His place in our lives. II. What are the conditions God states for giving His blessings? A. God says “If we will humble ourselves…” The presence of humility in a believer’s life is the heart and soul his being able to live the good and wonderful life God has ordained for us. 1. Oh what pain and heartache the believer bears who will not submit themselves humbly to the Lord. 2. How many professing Christians are in a constant war with God? Knowing what is right…yet fighting with God, trying to justify our sins and unfaithfulness. 3. How many professing Christians are miserable because there is unconfessed sin in their lives. Sin that separates us from the peace and joy of knowing God. To proud to repent as 1 John 1:9 says and admit our sins to the Lord and ask Him to remove them from us. 4. How many folks in churches are too proud to forgive others. The importance of forgiveness is clearly emphasized in the Model Prayer the Lord gave His disciples. Jesus said to forgive others their trespasses against us…just like God has forgiven the believer. He also said….if we refused, He could not forgive us. What should we forgive….what trespasses….all of them without exception. B. If my people will pray. 2. Living by faith means being dependent on God. Being dependent on God means consulting Him daily as we live our lives. It means to involve Him moment by moment in all we do. 3. It means expressing our thanksgiving to the Lord for thanking Him constantly for His suffering and sacrifice for us. How calloused we can be….living without having a grateful heart and expressing it to the Lord. 4. How foolish we are too…in that we do not ask for God’s help. We go about our business in our own self sufficiency ignoring God. This results then in God not being able to strengthen and help us…..we rob ourselves of His blessing and then cry and blame God for not helping us…..when the problem is not with God but with us. 1. This is stated in the New Testament also. “If ye then be risen with Christ, seek those things which are above, where Christ sits at the right hand of God. Set your affection on things above, not on things on the earth” Col. 3:1–2). 2. When you see someone’s face you are standing in front of them. It means you are in their presence. It means they are looking at you and you have their attention. 3. In Revelation 22: 4-5 God gives us a glimpse of the future heaven He has promised to those who believe in Him. The passage says, “And they shall see his face; and his name shall be in their foreheads. And there shall be no night there; and they need no candle, neither light of the sun; for the Lord God giveth them light: and they shall reign for ever and ever. 4. It means to be able to stand unashamed in the present of God in all His righteousness and holiness. 1. We want to gloss over sin. Often we try to justify our unfaithfulness to the Lord. 2. We make all kinds of excuses as to why we allow sin in our lives. 3. We often read this passage and say to ourselves that we are not wicked….because this refers to gross sins. But dear friend…it that really what it means? 4. It is not wicked to leave God out of our daily lives. It is not wicked to shun worship. It is not wicked to take His day, Sunday, a day of worship and spend it like the world does. 5. Is it not wicked when there is little or no difference in our lives than the lost around us. 6. What a joy to be in fellowship with the Lord. What a peace comes from being reconciled to Him. What an example we are for the Lord in our families, church and neighbors when we turn from wickedness unto godly faithful living.Conclusion: God’s sure promises. A. How many of us here really want God to hear us, forgive our sins and heal our land. B. How many here are tired of the Devil’s substitutes. How many are tired of being miserable inside, in constant conflict with ourselves and those around us. 1. How many of us want the peace and joy of our salvation? 2. How many of us want to see our children, our families, our neighbors saved and living for the Lord? C. God’s promises are sure. He our God and Creator has told us the way to peace and to live the best life we can. 1. Do we believe Him? 2. Do we really want His blessings? 3. The choice is ours. D. God puts the conditions on His blessing because He will not violate our wills. He will not force Himself on us, nor make us live good and godly lives. He wants it for us….He died on the cross to make it available to us….but He will not force you or me to do right. E. If God spoke in a audible voice to you this morning. If He beckoned you to turn wholly to Him….to turn in repentance to serving Him…would you do it. Do you believe I have preached this passage correctly? I will answer the question myself….. YES absolutely. God has spoken here this morning. The hope of our nation will not be determined by any Tuesday’s election….but daily, as those who profess to be Christians, vote their true hearts by how they live their lives. Every day is Election Day for the Christian….We are electing to serve the Lord or to serve our Enemy Satan. We are casting our vote at God’s polling place. That polling place is where we live. Our families, neighborhoods, work place, community and yes….in our church. The choice is living in the blessings of God….or the under the destructive curse of sin and unfaithfulness. It is a choice of honoring Jesus Christ who suffered and died for us…or living with a callous which ignores God’s love and why He wants to help us live godly, successful, lives of peace and joy. Christians are both sinners and saints. All human beings are sinners because we are born in sin. But not all humans are saints. According to the Bible, a saint is not someone who has done wonderful things, nor is it someone who has been deemed a saint by a church or organization. The word translated “saint” in the New Testament, hagios, literally means “sacred, physically pure; morally blameless or religious; ceremonially consecrated; holy.” In the context of New Testament passages, saints are those who belong to the body of Christ, saved by grace through faith (Ephesians 2:8–9). In other words, saint is another word for a Christian, a true believer in the Lord Jesus Christ. It is a clear biblical truth that all are born in sin and all have a sin nature. Scripture says that God created humankind originally good and without a sin nature: “Then God said, ‘Let Us make man in Our image, according to Our likeness.’ . . . God created man in His own image, in the image of God He created him; male and female He created them” (Genesis 1:26–27). However, Genesis 3 records the fall of Adam and Eve, and with that fall sin entered into the two previously sinless creatures. And when they had children, their sin nature was passed along to their offspring. Thus, every human being is a sinner. Saints, on the other hand, are not born saints; they become saints by being reborn. Because we have all “sinned and fallen short of the glory of God” (Romans 3:23), we are all in need of spiritual rebirth, without which we will continue in our sinful state throughout eternity. But God, in His great mercy and grace, has provided the (only) means for turning a sinner into a saint—the Lord Jesus Christ, who came “to give His life as a ransom for many.” When we confess our need for a Savior from sin and accept His sacrifice on the cross on our behalf, we become saints. There is no hierarchy of saints. All who belong to Christ by faith are saints, and none of us are more “saintly” than our Christian brothers and sisters. The apostle Paul, who is no more of a saint than the most obscure Christian, begins his first letter to the Corinthian church by declaring that they were “sanctified in Christ Jesus and called to be saints, together with all those who in every place call upon the name of our Lord Jesus Christ” (1 Corinthians 1:2, emphasis added). In this verse, hagios is translated “saints,” “holy,” and “sanctified” in different Bible versions, leading to the unmistakable conclusion that all who have ever called upon Christ for salvation are saints, made holy by the Lord. We are all “fellow citizens with the saints and members of the household of God” (Ephesians 2:19). We are not saints because we have been declared to be saints by a church, nor can we work our way to sainthood. Once we are saved by faith, however, we are called to certain actions befitting our calling as saints of God. “But just as he who called you is holy, so be holy in all you do; for it is written: ‘Be holy, because I am holy’” (1 Peter 1:15–16). Saints are not sinless, but the lives of saints do reflect the reality of the presence of Christ in our hearts, in whom we “live and move and have our being” (Acts 17:28). Without question the greatest reason that we live for God is our unwavering belief in the resurrection of His Son, Jesus Christ. It is through His resurrection from the grave that we have hope and the promise of life eternal with him. In 1 Corinthians chapter 15, the apostle Paul explains that, because of these promises of a future resurrection and of living eternally in the kingdom, believers have not only the motivation but also eternal responsibilities for our lives here on earth. The apostle Paul touches on such responsibilities in his concluding statement in the 15th chapter of his first letter to the Corinthians. He declares that, if we really believe and if we are truly thankful that our resurrection is sure, we should “therefore” demonstrate our assurance and our thankfulness by “standing firm, letting nothing move us” and “always giving ourselves full to the work of the Lord” (1 Corinthians 15:58). This, then, is the believer’s responsibility: to stand firm in the faith and give himself completely to the Lord. The Greek for “standing firm” is hedraios, which literally refers to “being seated, being settled and firmly situated.” The Greek for “letting nothing move you” is ametakinetos, and it carries the same basic idea but with more intensity. It means “being totally immobile and motionless,” indicating that we should not even budge an inch from His will. And with our being totally within the will of God, we are to be “always giving ourselves to the work of the Lord,” being careful not to be “tossed back and forth by the waves, and blown here and there by every wind of teaching and by the cunning and craftiness of men in their deceitful scheming” (Ephesians 4:14). Why did Paul give us this warning? Simply because, if our confident hope in the resurrection wavers, we are sure to abandon ourselves to the ways and standards of the world. Therefore, if there are no eternal ramifications or consequences of what we do in this life, the motivation for selfless service and holy living is gone. In other words, our eternal responsibilities are abandoned. Conversely, when our hope in the resurrection is clear and certain, we will have great motivation to be attending to the responsibility we have to “always giving ourselves to the work of the Lord.” The Greek for this phrase carries the idea of exceeding the requirements, of overflowing or overdoing. A good example of this is found in Ephesians 1:7-8 where the word is used of God having “lavished” upon us the riches of His grace. Because God has so abundantly provided for us who deserve nothing from Him, we should determine to give of ourselves abundantly in service to Him, to whom we owe everything. The Bible teaches us that our responsibility as believers is to work uncompromisingly as the Lord has gifted us and leads us in this life. We must fully understand that until the Lord returns there are souls to reach and ministries of every sort to be performed. We are responsible for our money, time, energy, talents, gifts, bodies, minds, and spirits, and we should invest in nothing that does not in some way contribute to the work of the Lord. James tells us, “As the body without the spirit is dead, so faith without deeds is dead” (James 2:26). Our work for the Lord, if it is truly for Him and done in His power, cannot fail to accomplish what He wants accomplished. Every good work believers do has eternal benefits that the Lord Himself guarantees. Jesus tells us, “Behold, I am coming soon! My reward is with me, and I will give to everyone according to what he has done” (Revelation 22:12). Simply put, our responsibility lies in working for the Lord, whether it is in “looking after orphans or widows in distress” (James 1:27), giving to the hungry, the naked, visiting those in prison (see Matthew 25:35-36), serving in our workplace (see Colossians 3:22), or doing whatever we do (Colossians 3:23). And our motivation is that we have God’s own promise that our work “is not in vain” in the Lord “since you know that you will receive an inheritance from the Lord as a reward. It is the Lord Christ you are serving” (Colossians 3:24). Wouldn’t it be great if the Christian life had a check list? A recipe of sorts to provide instructions that we could follow to ensure we were being “good Christians”? Few things in life really work that way. In fact, even recipes followed exactly don’t always turn out. They fail to account for effects of the weather, slight differences in ingredients, variance in oven temperatures, or a number of other factors. And “good” is in the taste buds of the eater. So what does it take to be a good Christian? Many will say that it means reading your Bible daily, praying at least twice a day, serving at church, tithing, supporting a missionary, evangelizing, and the like. These are all great activities for Christians, but they are not what the Christian life is all about. 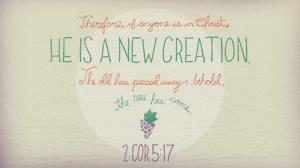 A Christian is someone who has been made new in Christ (2 Corinthians 5:17) and restored to relationship with God. The Christian life is about getting to know God, enjoying Him and bringing Him glory (Isaiah 43:7; 2 Corinthians 3:18; John 17:1–5, 22). It is true that when we know God certain actions will naturally result. Jesus said, “You are my friends if you do what I command” (John 15:14). But before that He said, “I am the true vine, and my Father is the gardener. . . . Remain in me, as I also remain in you. No branch can bear fruit by itself; it must remain in the vine. Neither can you bear fruit unless you remain in me. . . . This is to my Father’s glory, that you bear much fruit, showing yourselves to be my disciples. As the Father has loved me, so have I loved you. Now remain in my love. If you keep my commands, you will remain in my love, just as I have kept my Father’s commands and remain in his love. I have told you this so that my joy may be in you and that your joy may be complete” (John 15:1–11). Obedience—living the “good Christian” life—flows from a loving relationship. And obedience helps us remain in God’s love and therefore experience His joy. Being a “good Christian” is not about performing certain actions. It is about growing in love for Christ and allowing His Holy Spirit to transform our hearts and lives. Jesus is the author and perfecter of our faith (Hebrews 12:2), the recipe-writer and taste-tester for our lives. As we seek to know God and glorify Him, we also get to enjoy Him (Psalm 73:25—26). The good Christian knows God, enjoys God, and grows in grace. So the Christian life is one lived by faith in the God who saved us, empowers us, seals us for heaven, and by whose power we are kept forever. The day-to-day life of faith is one that grows and strengthens as we seek God in His Word and through prayer and as we unite with other Christians whose goal of Christlikeness is similar to our own.